Wood for ship models is, in my mind, a clear choice - especially for beginners. There are many species to choose from and they span a wide range in terms of properties and suitability for any given application or construction method. The purpose of this page is to give you an idea of popular wood species used for ship models and for which purpose they are best suited. Balsa is sometimes scuffed at by experienced builders as a wood for ship models you should eventually "graduate" from. I tend to disagree. I still use it quite a lot. Balsa is a great place to start if you have never built wood ship models before, regardless of building methods. It carves and bends easily and is inexpensive compared to most other hobby materials. Balsa creates a light and fine dust when sanded that I don't particularly like. It also has a "grain fuzz" that remain after being sanded and requires extra attention in the sanding and sealing process. The most common method is the tissue and dope process, although sealing with fiberglass and epoxy is steadily gaining. When using Balsa wood for ship models, you can get by with a minimal tool arsenal. An X-acto knife or single edged razor blade and some sand paper will get you far. Next, I'd recommend a small model plane (one of those that takes a razor blade). Even a Dremel tool is often overkill. The biggest issue with balsa for wood ship models is that if improperly sealed it will absorb large amounts of water. If that happens it is likely to start rotting and deteriorate from inside. Wood for Ship Models: Balsa, Basswood and Lite-ply (from top to bottom). Basswood is very popular amongst wood carvers and is one of the classic wood ship models used for bread-and-butter museum models. It has a very fine grain texture which makes finishing relatively easy. 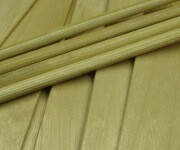 Basswood can be bought in the US in craft and hobby stores or on-line in the form of sticks, sheets and blocks. Among dedicated plank-on-frame ship model builders it is not seen as a very sophisticated material. Maybe due to it's limited strength and relatively poor bending properties. I find it pleasant to work with and is a natural next step after balsa. It can be worked with hand tools relatively easily. Lite-ply, as the name implies, is a plywood that is a light weight poplar plywood. It looks a lot like the bending plywood you may be familiar with if you're a woodworker. It feels a lot lighter than Baltic birch plywood, but not quite as light as Basswood. It also cuts easily - a fresh blade in a utility knife does the trick. While it certainly scores points against Baltic birch plywood as a wood model ships in handling and weight, it looses in mechanical strength. Nevertheless, as with basswood, it is a good alternative if you feel you're 'passed' balsa. It's biggest downfall is that it rarely comes flat. I would avoid it where flatness and/or straightness is important, such as keel and ribs. I have seen in available in 1/8" and 1/4" thickness in the US. Different size pieces of nice grade Poplar. Poplar is probably the least expensive, readily available hardwood in the USA. I suspect that is true for any place in the world where it grows domestically. This is a good choice for bread-and-butter hulls. It can be bought in FAS grade at most home improvement stores at a very reasonable cost. It is relatively easy to work, as long as you keep your tools sharp. It is relatively light for a hardwood. One word of caution: the dust may cause allergies in some individuals. As always when abrading or using power tools: wear a dust mask (and I should take my own advice 8^). Alder is my personal favorite for carving a bread-and-butter hull. It has gained in popularity lately, and prices has been steadily increasing. Alder is most common in the North Eastern USA. It looks a lot better than poplar and is easier to work in my opinion. Pine construction lumber is an economical alternative for solid hulls and bread-and-butter model boats. The two biggest issues are yield and stability. 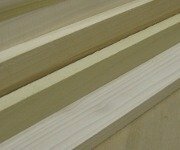 Price per board-foot may be less than Poplar, but chances are you have to scrap a lot of wood due to knots, checks, twist and cracks. Wood for ship models: Spruce and Pine (from top to bottom). Construction grade pine is also not as well seasoned as most hardwoods, resulting in boards warping and checking. I've used pine for bread-and-butter hulls, but in retrospect I think I would have saved money by using Poplar due to poor yield. Spruce is another of my favorite woods. I use it for masts and spars. It is strong, stiff and light weight. It turns nicely on a lathe too. Spruce doesn't bend easily so I wouldn't recommend it for hull planking. 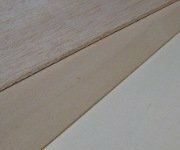 Baltic birch plywood (sometimes Russian birch plywood) is close grain, light in color, very strong and relatively inexpensive. Locally you can find it in the hobby and craft stores in smaller pieces (12 by 36 inches max usually). You'll get considerably more for your money if you venture to the local home improvement store or lumber yard. There the sheets usually come in five-by-five foot sheets, or sometimes in four-by-eight sheets. Some places are equipped and willing to cut the sheets into smaller pieces for you. Typically one or two cuts are 'free'. Any additional cut is very reasonably priced. 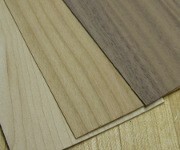 Note that plywood comes in different grades depending on quality and finish. Best balance between quality and price in my opinion is "BB" quality. In this grade some tight knots, mineral streaks and patches in the face veneer are allowed. Both faces are sanded to a nice smooth finish. I mainly use Baltic birch plywood for inner structure components of the hull and sometimes in the superstructure - components like bulkheads, false keels, decks (to be strip planked or painted). It is also used where extra support is needed, such as motor mounts, servo bridges and rudders. The thinner sizes can also be used favorably for hull planking, especially for hard chine hulls. Watch the weight though. 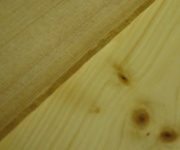 Maple lumber is light in color, with close grain, and is relatively hard. It finishes nice and holds sharp edges well. It is suitable for deck and hull planking and for general details. From left: maple, cherry and walnut. These domestic hardwood make excellent model building materials. For instance, it makes beautiful blocks for historic sailing ship model rigging. Maple is generally too hard and heavy for bread-and-butter hulls. I could see maple used by experienced builders making small solid hulls and water-line models. Because of it's hardness it's tough going and I wouldn't recommended maple for beginners. Another wood for ship models I enjoy working with is Cherry. It is close grained, medium reddish brown to almost pink in hue. Carves and turns well. Smells fantastic when cut and milled. The color will darken with age as the wood oxidizes and leaves an amazing patina if you give it time. The downsides: it's pricey, have pitch pockets, have a distinct light colored sapwood not nearly as attractive as the darker heartwood. Still, cherry is well suited wood ship models for frames, keels and planking for plank-on-frame models as well as various details, deck furniture, gunwales, hatches, figure heads etc. Walnut is another favorite of mine. It is one of the most beautiful domestic wood species. It is dark chocolate brown and carves, turns and bends like a dream. It is open grain, so it needs to be sealed well compared to maple and cherry for example. The downside is that because of it's favorable properties, it is very desirable for interiors and furniture. High demand makes the price go up. Just like cherry, it can be used for frames, keels and planking for plank-on-frame models as well as various details, deck furniture, gunwales, hatches, figure heads etc. One area where walnut stands out is in bending, which makes it superior for hull planking. As always, make sure the grain is straight on the planks or else they'll split and crack. Oak is by far the most common wood used for full size ships and boats through the ages. For models it is of limited use. It's grain is very coarse and it is difficult to work with. It's best use is in large scale boats where the coarse texture is less obvious. Many experienced woodworkers like it and default to it when they try their hands on model boats for the first time. If you like it and have experience with it, by all means - go for it. Where it does excel is in bending, so for plank-on-bulkhead model boats it has its place. I saw an impressive tug boat planked with oak and painted. It looked great. Mahogany used to be a prime material in model boat building. It's lighter in color than walnut, but can be just as stunning. It s one of the strongest hardwoods for its weight. This is why it has been used extensively in classic boat building, whether it is sailing yachts, speed boats or racers. Because of heavy harvesting in South America, true Mahogany is getting scarce and expensive. Because it's from the rain forest I prefer not to use it. There are several species, but the one you want is the European Boxwood. Builders of historic ship models swear by it for just about anything. It carves well, holds an edge like no other, and bends really well. Boxwood is a small tree or a bush, and extremely slow-growing. This is one of the reasons you'll hardly ever see boards of boxwood, but just small pieces and sticks. The wood is extremely fine grain, hard and strong. Most people have never heard of it and it's just as well, because it's dang near impossible to get a hold of. Personally, I'll leave it for the die-hard experts. Ebony is almost black in color and very heavy and hard. Most common item made of ebony is the black keys on old pianos. A little easier to find than boxwood maybe, but getting scarce. It's also raved about by historic ship builders for wales and strakes where its natural color will be utilized. This is the same as the evergreen tree with the red berries and prickly leaves that are so popular at Christmas time. The wood is extremely fine grained and white, sometimes with a tint of green. It's another model building material difficult to find, but raved about by the age-of-sail ship builders. It's suitable anywhere a light colored wood is desired. Carves well and turns on the lathe with sharp details. The grain may sometimes be somewhat wavy. If strips are ripped from such a board, they will be a challenge to bend without breaking. Wood for ship models: bamboo skewers and Popsicle sticks! Sometimes useful materials can be found in the most unexpected places. When you walk around the hardware, craft or even grocery store it helps to keep an eye out for things that can be used for your model boats. For instance, bamboo skewers and tooth picks makes great basis to make tree nails. A Popsicle sticks can be used for various reinforcements, such as running the height of the stem for a built-in fender on an otherwise mostly balsa model.